1Department of mechanical engineering, Malla Reddy Engineering College, Hyderabad, Telangana, 500100, India. 2Department of mechanical engineering, National Institute of Technology Warangal, Warangal, Telangana, 506004, India. Engine modification through reducing nozzle hole diameter (NHD) (i.e., from the base value of 0.28 to the modified value of 0.20 mm) has been shown as an effective strategy in improving engine performance, combustion, and emission parameters. However, it has also led to substantial increases in NOx emission as a major shortcoming. In light of that, the present study was aimed at overcoming this challenge through the application of a partially-cooled exhaust gas recirculation (EGR) system. More specifically, Mahua oil biodiesel-diesel blend (B20) and neat diesel were tested on a modified single cylinder diesel engine under five different engine loads (i.e., 2.46, 4.92, 7.38, 9.84, and 12.3 kg) and in the presence of varying EGR rates (i.e., 10, 20, and 30%). The results obtained revealed that the performance, combustion, and emission characteristics of the modified engine (3-hole nozzle with an orifice diameter of 0.20 mm) were improved for both neat diesel and B20 except in the case of NOx, in comparison with those of the conventional diesel engine (3-hole nozzle with an orifice diameter of 0.28 mm). The considerable increases in NOx emissions caused by the smaller orifice NHD could be successfully compensated for through the implementation of the partially-cooled EGR. Overall and based on the findings of the present study, the proposed engine modification in the presence of partially-cooled EGR rate of 10% could be recommended as efficient combustion conditions for 20% blend of Mahua oil biodiesel and diesel. However, further increments in the EGR rate and in particular at higher loads, adversely affected the performance and emission characteristics of the modified engine due to the recirculation of high amounts of unburnt soot, CO2, H2O, as well as of O2 deficiency. Engine modification through reducing NHD improved combustion characteristics but deteriorated NOx emissions. 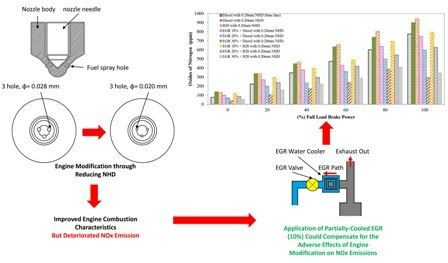 Application of partially-cooled EGR could compensate for the adverse impacts of engine modification on NOx emissions. The EGR rate of 10% was found promising in substatially reducing NOx emissions at all loads. High EGR rates esp. at higher loads, adversely affected the performance and emission characteristics of the modified. Achten, W.M.J., Verchot, L., Franken, Y.J., Mathijs, E., Singh, V.P., Aerts, R., Muys, B., 2008. Jatropha bio-diesel production and use. Biomass Bioenergy. 32(12), 1063-1084. Agarwal, A.K., Dhar, A., 2013. Experimental investigations of performance, emission and combustion characteristics of Karanja oil blends fuelled DICI engine. Renew. Energy. 52, 283-291. Atabani, A.E., Silitonga, A.S., Ong, H.C., Mahlia, T.M.I., Masjuki, H.H., Badruddin, I.A., Fayaz, H., 2013. Non-edible vegetable oils: a critical evaluation of oil extraction, fatty acid compositions, biodiesel production, characteristics, engine performance and emissions production. Renew. Sust. Energy Rev. 18, 211-245. Azam, M.M., Waris, A., Nahar, N.M., 2005. Prospects and potential of fatty acid methyl esters of some non-traditional seed oils for use as biodiesel in India. Biomass Bioenergy. 29(4), 293-302. Bai, Y.L., Wang, Z., Wang, J.X., 2010. Part load characteristics of direct injection spark ignition engine using exhaust gas trap. Appl. Energy. 87(8), 2640-2646. Can, Ö., Öztürk, E., Solmaz, H., Aksoy, F., Çinar, C., Yücesu, H.S., 2016. Combined effects of soybean biodiesel fuel addition and EGR application on the combustion and exhaust emissions in a diesel engine. Appl. Therm. Eng. 95, 115-124. Channapattana, S.V., Pawar, A.A., Kamble, P.G., 2015. Effect of injection pressure on the performance and emission characteristics of VCR engine using Honne biodiesel as a fuel. Mater. Today Proc. 2(4-5), 1316-1325. Chauhan, B.S., Kumar, N., Cho, H.M., 2012. A study on the performance and emission of a diesel engine fueled with Jatropha biodiesel oil and its blends. Energy. 37(1), 616-622. Chauhan, B.S., Kumar, N., Cho, H.M., Lim, H.C., 2013. A study on the performance and emission of a diesel engine fueled with Karanja biodiesel and its blends. Energy. 56, 1-7. Dubey, P., Gupta, R., 2018. Influences of dual bio-fuel (Jatropha biodiesel and turpentine oil) on single cylinder variable compression ratio diesel engine. Renew. Energy. 115, 1294-1302. Duraisamy, M.K., Balusamy, T., Senthilkumar, T., 2011. Reduction of NOx emission in Jatropha seed oil fueled CI engine. ARPN J. Eng. Appl. Sci. 6(5), 34-39. Fontana, G., Galloni, E., 2010. Experimental analysis of a spark-ignition engine using exhaust gas recycle at WOT operation. Appl. Energy. 87(7), 2187-2193. Ganapathy, T., Gakkhar, R.P., Murugesan, K., 2011. Influence of injection timing on performance, combustion and emission characteristics of Jatropha biodiesel engine. Appl. Energy. 88(12), 4376-4386. Gnanasekaran, S., Saravanan, N., Ilangkumaran, M., 2016. Influence of injection timing on performance, emission and combustion characteristics of a DI diesel engine running on fish oil biodiesel. Energy. 116, 1218-1229. Godiganur, S., Murthy, C.S., Reddy, R.P., 2009. 6BTA 5.9 G2-1 Cummins engine performance and emission tests using methyl ester mahua (Madhuca indica) oil/diesel blends. Renew. Energy. 34(10), 2172-2177. Gui, M.M., Lee, K.T., Bhatia, S., 2008. Feasibility of edible oil vs. non-edible oil vs. waste edible oil as biodiesel feedstock. Energy. 33(11), 1646-1653. Gumus, M., Sayin, C., Canakci, M., 2012. The impact of fuel injection pressure on the exhaust emissions of a direct injection diesel engine fueled with biodiesel-diesel fuel blends. Fuel. 95, 486-494. Herbinet, O., Pitz, W.J., Westbrook, C.K., 2008. Westbrook. Detailed chemical kinetic oxidation mechanism for a biodiesel surrogate. Combust. Flame. 154(3), 507-528. Hussain, J., Palaniradja, K., Alagumurthi, N., Manimaran, R., 2012. Petracted: effects of exhaust gas recirculation (EGR) on performance and emission characteristics of a three cylinder direct injection compression ignition engine. Alexandria Eng. J. 51(4), 241-247. Hussain, J., Palaniradja, K., Alagumurthi, N., Manimaran, R., 2012. Retracted: effect of exhaust gas recirculation (EGR) on performance and emission characteristics of a three cylinder direct injection compression ignition engine. Alexandria Eng. J. 51(4), 241-247. Jena, P.C., Raheman, H., Kumar, G.P., Machavaram, R., 2010. Biodiesel production from mixture of mahua and simarouba oils with high free fatty acids. Biomass Bioenergy. 34(8), 1108-1116. Jindal, S., Nandwana, B.P., Rathore, N.S., Vashistha, V., 2010. Experimental investigation of the effect of compression ratio and injection pressure in a direct injection diesel engine running on Jatropha methyl ester. Appl. Therm. Eng. 30(5), 442-448. Karmee, S.K., Chadha, A., 2005. Preparation of biodiesel from crude oil of Pongamia pinnata. Bioresour. Technol. 96(13), 1425-1429. Koh, M.Y., Ghazi, T.I.M., 2011. 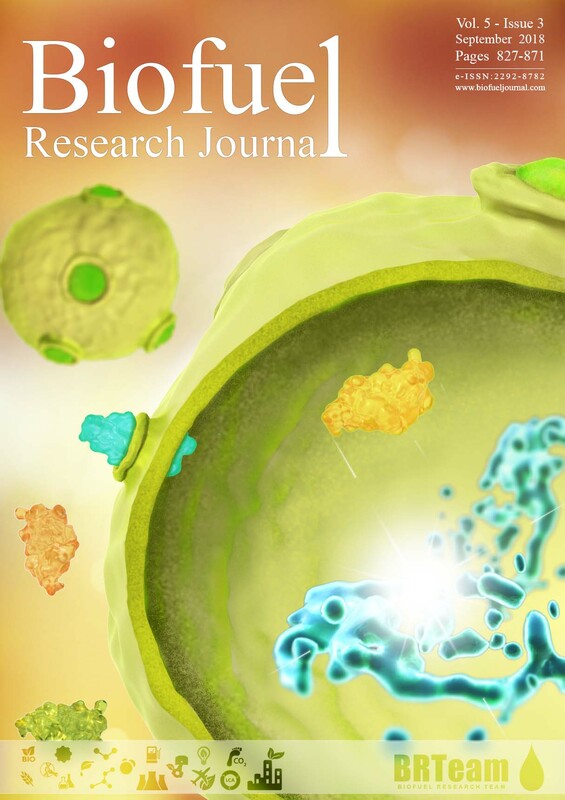 A review of biodiesel production from Jatropha curcas L. oil. Renew. Sust. Energy Rev. 15(5), 2240-2251. Koutroubas, S.D., Papakosta, D.K., Doitsinis, A., 1999. Adaptationandyieldingabilityof castor plant (Ricinuscommunis L.) genotypes in a Mediterranean climate. Eur. J. Agron. 11(3-4), 227-237. Kumar, A., Sharma, S., 2011. Potential non-edible oil resources as biodiesel feedstock: an Indian perspective. Renew. Sust. Energy Rev. 15(4), 1791-1800. Kusaka, J., Okamoto, T., Daisho, Y., Kihara, R., Saito, T., 2000. Combustion and exhaust gas emission characteristics of a diesel engine dual-fueled with natural gas. JSAE Rev. 21(4), 489-496. Lai, J.Y., Lin, K.C., Violi, A., 2011. Biodiesel combustion: advances in chemical kinetic modeling. Prog. Energy Combust. Sci. 37(1), 1-14. Liaquat, A.M., Masjuki, H.H., Kalam, M.A., Varman, M., Hazrat, M.A., Shahabuddin, M., Mofijur, M., 2012. Application of blend fuels in a diesel engine. Energy Procedia. 14, 1124-1133. Mani, M., Nagarajan, G., Sampath, S., 2010. An experimental investigation on a DI diesel engine using waste plastic oil with exhaust gas recirculation. Fuel. 89(8), 1826-1832. Mofijur, M., Masjuki, H.H., Kalam, M.A., Atabani, A.E., 2013. Evaluation of biodiesel blending, engine performance and emissions characteristics of Jatropha curcas methyl ester: Malaysian perspective. Energy. 55, 879-887. Mo, J., Tang, C., Li, J., Guan, L., Huang, Z., 2016. Experimental investigation on the effect of n-butanol blending on spray characteristics of soybean biodiesel in a common-rail fuel injection system. Fuel. 182, 391-401. Nabi, M.N., Akhter, M.S., Shahadat, M.M.Z., 2006. Improvement of engine emissions with conventional diesel fuel and diesel-biodiesel blends. Bioresour. Technol. 97(3), 372-378. Naik, M., Meher, L.C., Naik, S.N., Das, L.M., 2008. Production of biodiesel from high free fatty acid karanja (Pongamia pinnata) oil. Biomass Bioenergy. 32(4), 354-357. No, S.Y., 2011. Inedible vegetable oils and their derivatives for alternative diesel fuels in CI engines: a review. Renew. Sust. Energy Rev.15(1), 131-49. Pinzi, S., Garcia, I.L., Lopez-Gimenez, F.J., Luque de Castro, M.D., Dorado, G., Dorado, M.P., 2009. The ideal vegetable oil-based biodiesel composition: a review of social, economical and technical implications. Energy Fuels. 23(5), 2325-2341. Raheman, H., Ghadge, S.V., 2007. Performance of compression ignition engine with mahua (Madhuca indica) biodiesel. Fuel. 86(16), 2568-2573. Raheman, H., Phadatare, A.G., 2004. Diesel engine emissions and performance from blends of karanja methyl ester and diesel. Biomass Bioenergy. 27(4), 393-397. Rahman, S.A., Masjuki, H.H., Kalam, M.A., Abedin, M.J., Sanjid, A., Rahman, M.M., 2014. Assessing idling effects on a compression ignition engine fueled with Jatropha and Palm biodiesel blends. Renew. Energy. 68, 644-650. Rahman, S.A., Masjuki, H.H., Kalam, M.A., Abedin, M.J., Sanjid, A., Imtenan, S., 2014. Effect of idling on fuel consumption and emissions of a diesel engine fueled by Jatropha biodiesel blends. J. Cleaner Prod. 69, 208-215. Rajan, K., Senthilkumar, K.R., 2009. Effect of EGR on performance and emission characteristics of diesel engine with sunflower oil methyl ester. Jordan J. Mech. Ind. Eng. 3(4), 306-311. Ramadan, M.F., Moersel, J.T., 2003. Phospholipid composition of niger (Guizotia abyssinica cass.) seedoil. LWT-Food Sci. Technol. 36(2), 273-276. Ramadhas, A.S., Jayaraj, S., Muraleedharan, C., 2005a. Biodiesel production from high FFA rubber seed oil. Fuel. 84(4), 335-340. Ramadhas, A.S., Jayaraj, S., Muraleedharan, C., 2005b. Characterization and effect of using rubber seed oil as fuel in the compression ignition engines. Renew. Energy. 30(5), 795-803. Sahoo, P.K., Das, L.M., Babu, M.K.G., Naik, S.N., 2007. Biodiesel development from high acid value polanga seed oil and performance evaluation in a CI engine. Fuel. 86(3), 448-454. Saka, S., 2005. Production of biodiesel: current and future technology. In JSPS/VCO Core University program seminar, Universiti Sains Malaysia. 62-102. Sasaki, S., Sawada, D., Ueda, T., Sami, H., 1998. Effect of EGR on direct injection gasoline engine. JSAE Rev. 19(3), 223-228. Sharma, V., Das, L., Pradhan, R.C., Naik, S.N., Bhatnagar, N., Kureel, R.S., 2011. Physical properties of tung seed: an industrial oil yielding crop. Ind. Crops Prod. 33(2), 440-444. Shehata, M.S., Attia, A.M., Razek, S.A., 2015. Corn and soybean biodiesel blends as alternative fuels for diesel engine at different injection pressures. Fuel. 161, 49-58. Silitonga, A.S., Atabani, A.E., Mahlia, T.M.I., Masjuki, H.H., Badruddin, I.A., Mekhilef, S., 2011. A review on prospect of Jatropha curcas for biodiesel in Indonesia. Renew. Sust. Energy Rev. 15(8), 3733-3756. Singh, S.P., Singh, D., 2010. Biodiesel production through the use of different sources and characterization of oils and their esters as the substitute of diesel: a review. Renew. Sust. Energy Rev. 14(1), 200-216. Sivaramakrishnan, K., 2018. Investigation on performance and emission characteristics of a variable compression multi fuel engine fuelled with Karanja biodieselediesel blend. Egypt. J. Pet. 27(2), 177-186. Sureshkumar, K., Velraj, R., Ganesan, R., 2008. Performance and exhaust emission characteristics of a CI engine fueled with Pongamia pinnata methyl ester (PPME) and its blends with diesel. Renew. Energy. 33(10), 2294-2302. Venkanna, B.K., Reddy, C.V., 2009. Biodiesel production and optimization from Calophyllum inophyllum linn oil (honne oil)-A three stage method. Bioresour. Technol. 100(21), 5122-5125. Vijay Kumar, M., Veeresh Babu, A., Ravi Kumar, P., 2017a. Producing biodiesel from crude Mahua oil by two steps of transesterification process. Aust. J. Mech. Eng. 1-6. Vijay Kumar, M., Veeresh Babu, A., Ravi Kumar, P., 2017b. Experimental investigation on Mahua methyl ester blended with diesel fuel in a compression ignition diesel engine. Int. J. Ambient Energy. 1-13. Vijay Kumar, M., Veeresh Babu, A., Ravi Kumar, P., 2018a. The impacts on combustion, performance and emissions of biodiesel by using additives in direct injection diesel engine. Alexandria Eng. J. 57(1), 509-516. Vijay Kumar, M., Veeresh Babu, A., Ravi Kumar, P., 2018b. Experimental investigation on the effects of diesel and Mahua biodiesel blended fuel in direct injection diesel engine modified by nozzle orifice diameters. Renew. Energy. 119, 388-399. Vijayaraj, K., Sathiyagnanam, A.P., 2016. Experimental investigation of a diesel engine with methyl ester of mango seed oil and diesel blends. Alexandria Eng. J. 55(1), 215-221.